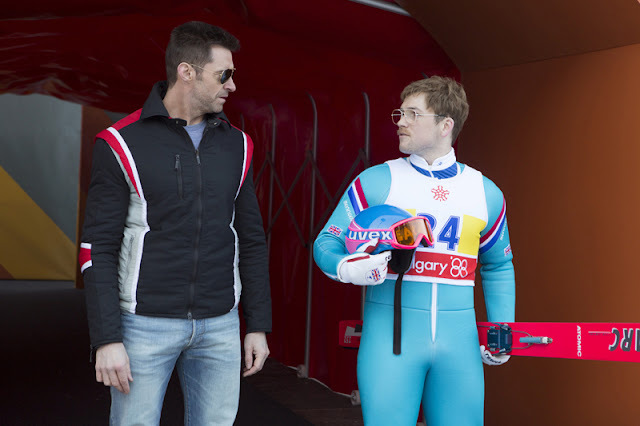 Inspired by true events, “Eddie The Eagle” is a feel-good story about an underdog with a never say die attitude, Michael “Eddie” Edwards (Egerton), an unlikely but courageous British ski-jumper who never stopped believing in himself – even as an entire nation was counting him out. With the help of a rebellious and charismatic coach (played by Hugh Jackman), Eddie takes on the establishment and wins the hearts of sports fans around the world by making an improbable and historic showing at the 1988 Calgary Winter Olympics. Eddie’s story is inspirational. Although he was never athletically gifted, from an early age he dedicated his life to achieving one goal: to become an Olympian. Eddie tried his hand at various sports and disciplines, before settling on downhill skiing. Having narrowly failed to make the British team at the Winter Olympics in 1984, he recalibrated and switched to ski jumping. It now seems almost impossible for someone to replicate Eddie’s achievements. As detailed in the film, the standards required to qualify for the ski jump were almost immediately increased by the International Olympic Committee. Eddie never qualified for the event again, although he was selected as a torchbearer for the 2010 Vancouver Olympics. “Eddie The Eagle” opens April 6 in theatres nationwide from 20th Century Fox to be distributed by Warner Bros.